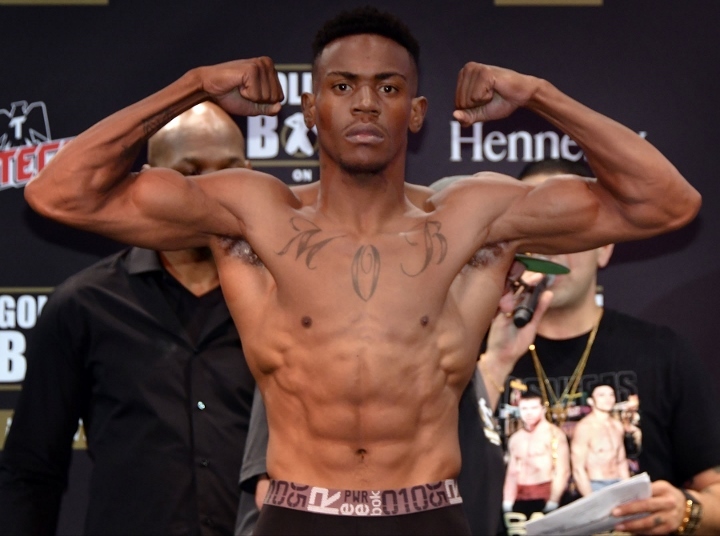 Park Theater, LAS VEGAS, NV - In the co-main event of the night, Keandre Gibson (17-1-1) defeated Alejandro Barrera (27-3) via majority decision in a bloody battle that he appeared to win at least 7 rounds. Both men fought on relatively even terms in the beginning of the fight. Barrera, who is trained by legendary Mexican trainer Nacho Beristain, started to pick up the pace in the third round attacking the head and body of his opponent. Gibson hit the canvas but referee Jay Nady correctly ruled it a slip in what was his best round of the fight. Big shots were exchanged to begin the fourth. Barrera's nose began to bleed profusely after being hit with a left hook while Gibson had a small cut on the side of his left eye. Gibson was able to box more effectively and for the most part stay away from Barrera's power shots. By the seventh round Barrera was also battling a cut on the side of his right eye that was bothering his vision. Barrera's power really started to decline from all of the punishment he absorbed earlier in the fight. Gibson really poured it on the ninth and had Barrera badly hurt to end the round. Gibson finished the fight strong to secure the victory. The final scores were 97-93, 98-92 and a head scratching 95-95. Unbeaten super featherweight prospect Bekman Soilybayev (12-0) kept his perfect record intact with an unanimous decision victory over Fernando Vargas (32-15-3). Nether fighter had much power and neither was really ever able to hurt the other man. Soilybayev's big advantage in boxing skill propelled him to the wide points victory. The final tallies were 100-90, 99-9 and 98-92 and with the win Soilybayev kept his WBC international super featherweight title. Local product Randy Moreno (10-1) opened the show up with a beat down of Raul Chirino (12-7). Moreno dropped Chirino twice in rote to the second round TKO. The time official time of the stoppage was 1:35. [QUOTE=Majic;18149391]Looks like we called it huh lol[/QUOTE] After the beatings Tapia had taken against Lemieux, Soro, and Kirkland, it would of been a miracle if he wasn't shot. IMO, Rosado looked pretty damn sharp too.